We’re back in Lancaster. David’s father is failing, so after two days at home, we loaded up the car and headed south again. Walking into the house last night, I noticed the rose bush by the back porch door. When we first arrived in Lancaster two weeks ago, there was only one blossom and one bud on the bush. Over the next week and a half, through managing to get David’s mother in a care facility, visiting David’s father at the hospital, picking up groceries, cleaning the house and taking loads of papers and magazines to the recycling center, going out in the morning to run or bike, going for a walk, I watched the bush put out more buds which opened into blossoms of loose pink petals that seemed to fall away by the next time I passed. 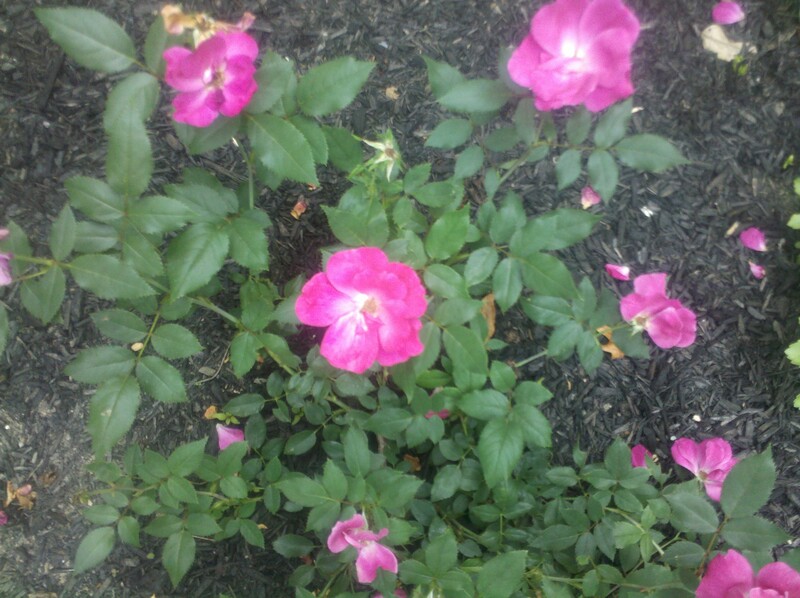 Last night and today the little bush is full of pink roses.